January 2012 serves as the nationwide kick-off to the second IDSA Design Learning Challenge. Only two percent of students said they'd never been bored in school. Just 41 percent of the students in the 2009 survey responded that they went to school because of what they learn in classes. Only 23 percent said they went because of their teachers. Around a third said they went because they enjoy being in school. The primary purpose of the IDSA DesignLearning Challenge 2012 is to expose young students to design thinking and create an active awareness of the discipline of industrial design as a career option before students leave high school. Regardless of career choice, the potential life skills gained by understanding the design process alone offers value. Embracing a Learn.Think.Do approach, each Design Learning Challenge 2012 Team will focus on one of the three submission categories: Design Day Event, Targeted Design Project or Industrial Design Awareness Campaign. The 2012 Submission Guidelines provide a systematic, yet flexible, action research framework for students to follow as they conduct, analyze, represent and submit their final design learning study report. Each team will tell their contextual story, content supported by a beginning, middle and end. Mentored by a local college design educator or practicing professional, college design students are encouraged to collaborate as multi-discipline teams with complementary disciplines. 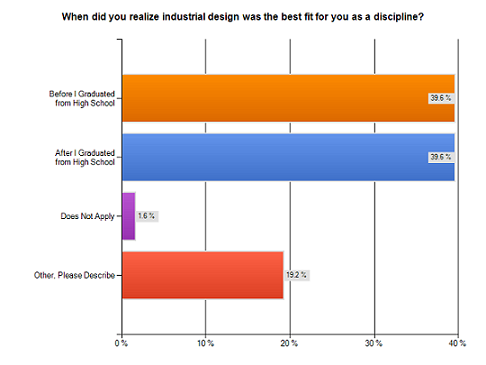 How and when did you realize industrial design was the best fit for you as a discipline? The focus of this year’s IDSA Design Learning Challenge is anchored in a recent research survey regarding the discovery process of the discipline of industrial design. We captured the voice of 250 practitioners, students and educators regarding how and when they realized industrial design was the discipline for them. Based on our findings, 36 percent of the participants were college design students, whereas 57 percent were design practitioners and/or educators. Most telling of our findings revealed insight into how and when students discovered the discipline. Data indicates 40 percent of the respondents knew of the discipline prior to high school graduation, whereas 40 percent did not discover the field until they had been enrolled in higher education for at least 1-3 years. Of those who were aware prior to high school graduation, 46 percent reported to have been motivated (in respective order) by a relative, art teacher, friend or school counselor. These findings underscore the deep passion we share to ensure that all students coming out of school should at least know and understand what design is and what it can do.